Motorcycle drag racing journalist John Stein is back with his multi-part series dedicated to the Pro Stock Motorcycle class. Click here, if you have not checked out Part 1 yet. It’s great reading. In many ways Bob Carpenter was a validation for Pro Stock Bike and its philosophy: A racer without significant sponsorship who could defeat those with it. 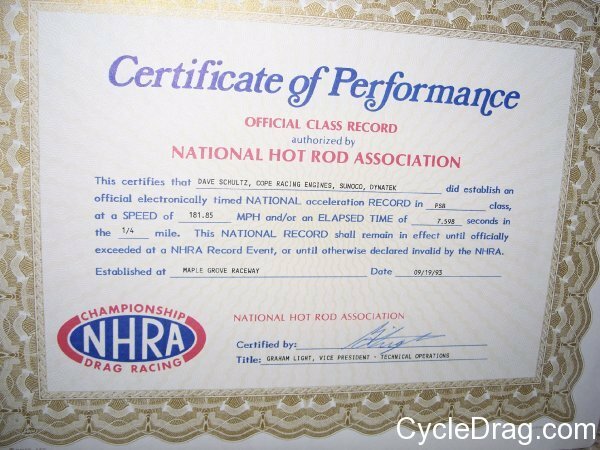 In the late Seventies, the Pennsylvania rider won both NHRA/NMRA and Dragbike! championships. 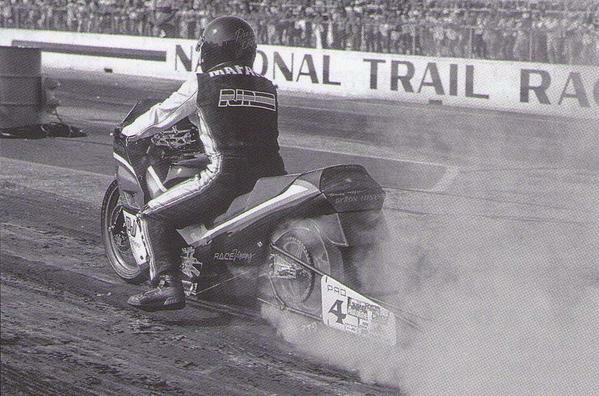 Even though Pro Stock Bike became an NHRA Eliminator in 1987, they promoted the class as far back as 1979. Bob Carpenter finished second at the ’79 Gatornationals, having been defeated by Wayne Buckler. Like Dave Schultz, Carpenter started in Pro Stock Bike on a 750cc Kawasaki two-stroke and had his first professional win in 1975 at a race in Beach Bend, Kentucky, where he defeated Mike Bruso with a 10.10 pass at 133.33 mph. Carpenter’s H-2 was far smaller in displacement than Bruso’s Z-1 but that didn’t matter. 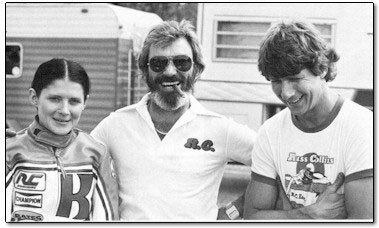 Motorcycle drag racing legends Vicki Farr, Russ Collins and Bob Carpenter. By the late Seventies four-strokes would be dominant and Carpenter in turn, began racing one. At the 1979 NHRA Winston World Finals at Ontario, Terry Vance on a Suzuki was favored to win the championship. Kawasaki Z-1-mounted Carpenter saw it differently. Although having won only the Summernationals that season, he was consistent enough to go into the race–the last of the season–with a lead of just over 200 points. Vance, however, qualified quickest and fastest, and set a new top speed record in the process—giving him a 37-point lead. In the Semi-Finals Vance defeated Ed Ryan on a Harley-Davidson. When it became time for Carpenter to race, his opponent Craig Burns failed to appear. In order to have a chance for victory though, Carpenter would have to better Vance’s 9.16 second time. He did, with a 9.15 to Vance’s 9.62–winning the race, championship, and $10,000 contingency from Kawasaki. 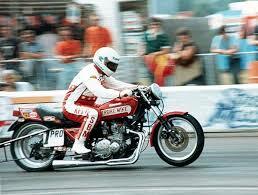 In 1980, Carpenter would again win the NHRA/NMRA Pro Stock Bike championship on a Z-1 and repeat it in 1983 on an R.C. Engineering Suzuki GS1100. Not surprisingly, when Byron Hines left R.C. Engineering to form his own company with Terry Vance, Carpenter was hired by Russ Collins to replace him. What didn’t stick was his job as an accountant. After becoming increasingly competitive, Keyte decided to devote himself full-time to racing. It quickly paid off. 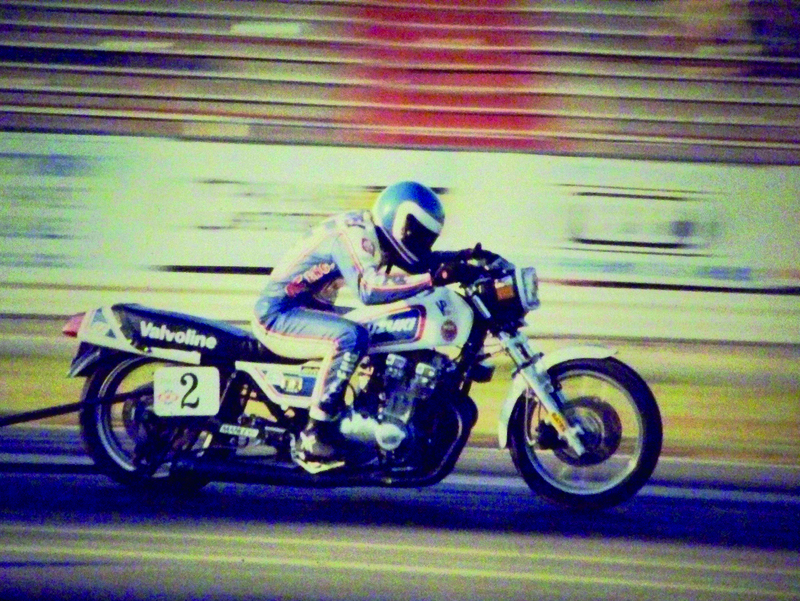 Over the years he would win four major championships–two of them on Kawasakis and two on Suzukis–and would be IDBA Pro Stock Bike champion in 1982 and 1984. 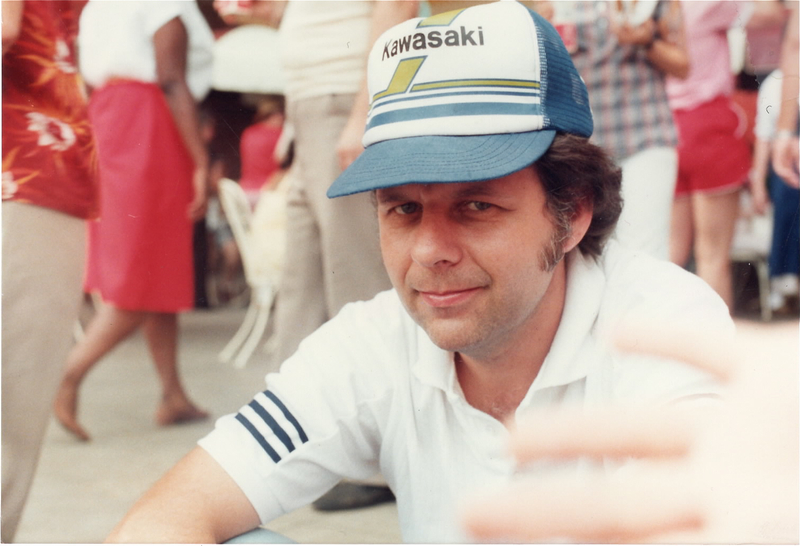 “Superbike” Mike Keyte started racing Pro Stock Bike on a Kawasaki and changed to Suzuki when their four-valve design was introduced. Not surprisingly then, he was constantly looking for ways to find more—in one instance borrowing an idea from dirt track racers by putting his left hand on the fork tube when in a tucked position and picking up half a mile per hour as a result of it. The sanctioning bodies weren’t as enthusiastic about the idea and Keyte was forced to look for others. In 1989, “Pizza John” Mafaro became the only Pro Stock Bike rider other than Terry Vance, Dave Schultz or John Myers to capture an NHRA Winston championship—and he did it with a truly innovative approach. Mafaro was one of the first to appreciate the importance of aerodynamics, spending countless hours in a wind tunnel. He found, for instance, a noticeable improvement when a rider’s rear end was lifted off the seat, which then led to the design of the “stepped” seat. Because riders were now able to use the lower, forward position for the launch and slide back onto the rear section after shifting into third gear, it was easier for them to tuck in their knees and helped smooth airflow over the rider’s back as well. Mafaro also determined that the “Ram Air” effect of having ducting from the front of the fairing into an air box provided additional horsepower. In all, the ducting and stepped seat were believed to lower elapsed time by .15 seconds and raise top speed by three mph. That of course, would change as the sport became more competitive and the demands on racers greater. It was no longer something one could do in their free time. For racers there wasn’t any. In addition to having been the first Pro Stock Bike rider into the eights when he recorded an 8.98 second run in 1979, Sid Pogue was also the first in the class to go more than 150 mph. “We had a 1260cc Kawasaki Z-1,” he said. “There was nothing particularly special about it. 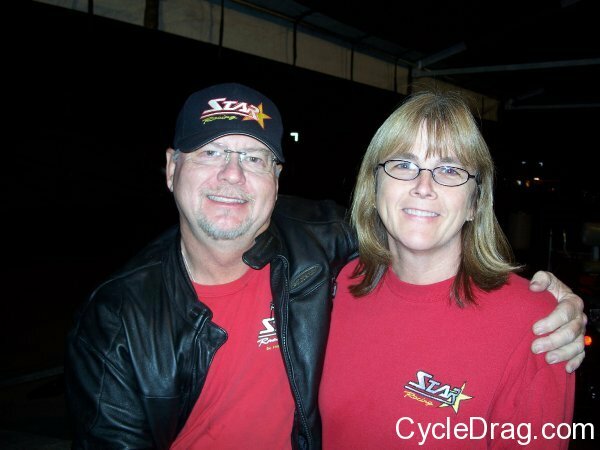 It was all about making everything work and pull together.” Clearly it did, as Pogue was IDBA champion in 1979 and 1981 and either winner or runner-up at every IDBA Pro Stock Bike final. In addition to having been the first Pro Stock Bike rider into the Eights when he recorded an 8.98 in 1978, Sid Pogue was also the first to go more than 150 mph. the most influential people in the history of the class because of the contributions of his company, Fast By Gast. Dave Schultz was one of those rare individuals who would have excelled at whatever he had chosen to do. What he chose to do, of course, was to drag race and for his considerable efforts, Schultz won 45 NHRA national events and six Winston championships. Schultz’ success was due in large part to an incredibly focused and methodical approach. At the time of his passing in 2001, no motorcycle drag racer had won more races, appeared in more final rounds, or earned more championships. 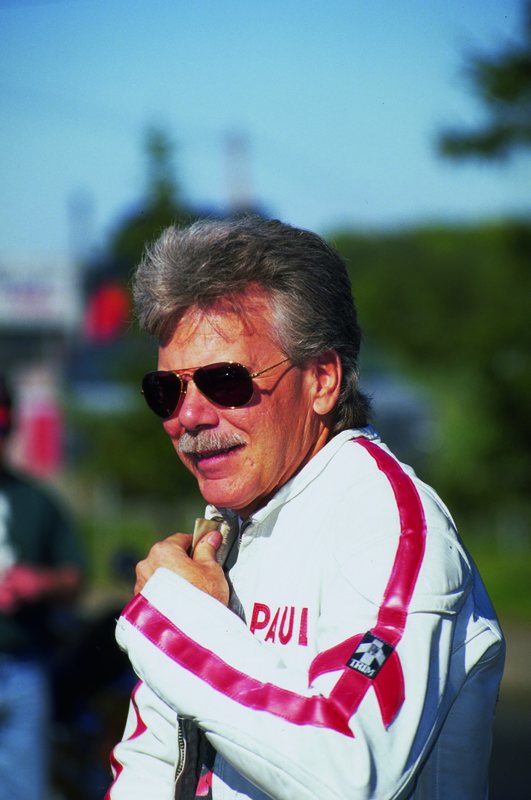 Over a 23-year career, Schultz won fifteen series championships and had more than 140 victories including the U.S. Nationals six times. And he was an equal opportunity winner, having captured championships in NHRA, Prostar and IDBA competition. Like many before him–and few after him–Schultz built, maintained, and rode his own machines. He was equally good at all of them. As an innovator Schultz was the first to incorporate an on-board computer, lowered steering head, vacuum pump, and air-in-frame technology. As an ambassador for the sport he and crew chief Greg Cope helped elevate it to true professional status and for years, their team was the benchmark by which others were measured. And as a racer, Schultz was virtually unbeatable. Though Schultz began racing a Super Stock Mustang in the mid-Sixties, it wasn’t long before he transitioned to motorcycles. 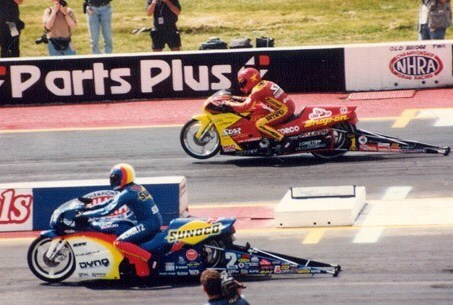 Nor was it long before he excelled at it: When Pro Stock Bike became an NHRA Eliminator in 1987 he won his first national event at the Winston Finals. 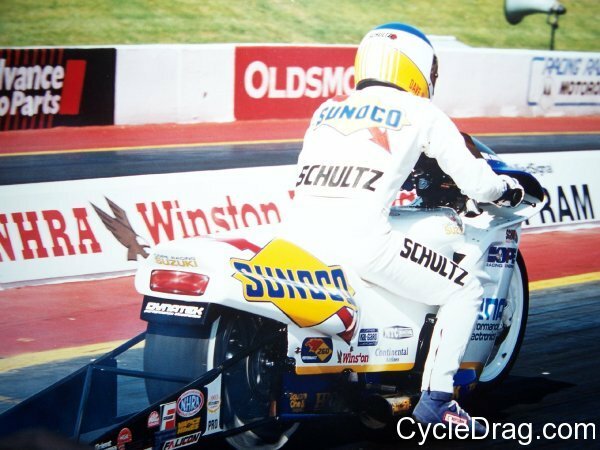 In 1991, Schultz claimed his first NHRA Pro Stock Bike championship. After finishing second to John Myers in 1992, Schultz was determined to regain his title once again. At the opening race of the 1993 season at Houston Raceway Park, he was thrown from his Lance Boyer-owned Suzuki and slid more than 800 feet. 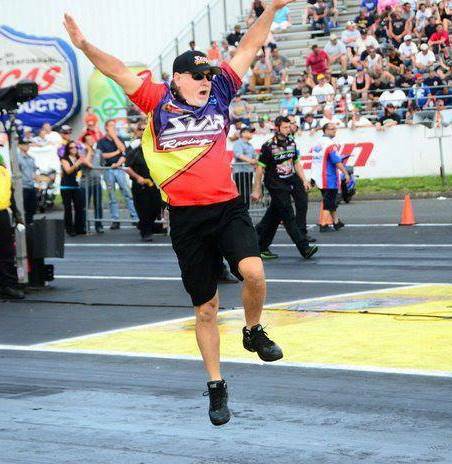 Although his right wrist was broken, Schultz would win seven events that season and take another NHRA championship–ending the year with a streak of six victories including a 7.59 second/181.85-mph run at the Keystone Nationals. 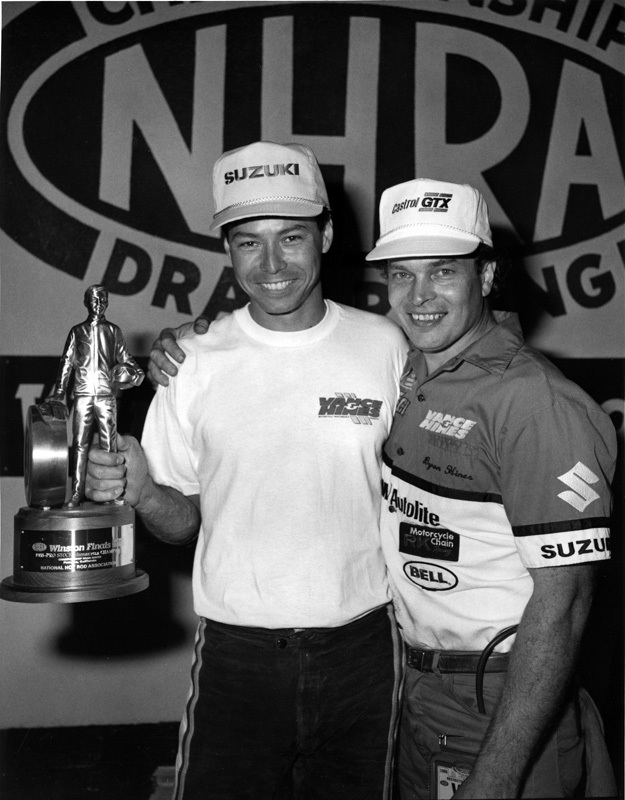 In 1994, Schultz/Cope won their third NHRA Pro Stock Bike championship—winning nine of eleven races and 40 rounds in eliminations while losing only twice–both of which were the result of red lights. He also had a record eight consecutive wins. His final event win came at the 2000 Matco Tools SuperNationals. Just days after completing a series of chemotherapy treatments, Schultz scored an emotional final round victory over Geno Scali. It was his forty-fifth and no doubt most rewarding national event title. Dave Schultz’ success was due in large part to an incredibly focused and methodical approach. At the time of his passing in 2001, no motorcycle drag racer had won more races, appeared in more final rounds, or earned more championships. If you asked Pro Stock Bike riders and spectators who their hero was, the name offered up most often would be John Myers. Second place, like those he raced against, would be well behind. 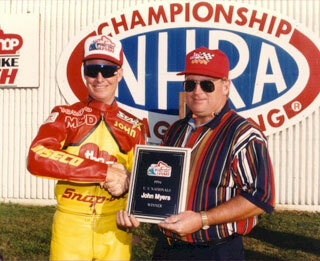 Over the course of his twelve-year professional career, John Myers had 33 wins including three U.S. Nationals titles. Here is a meeting of the minds in the trailer with Star Racing’s Ken Johnson and George Bryce. He did it often. The Birmingham, Alabama racer won NHRA Pro Stock Bike championships in 1990, 1992 and 1995, and the U.S. Nationals in 1989, 1996, and 1997. 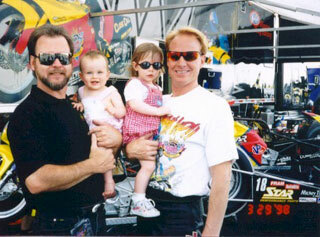 George Bryce and John Myers with their daughters in the pit area. She wasn’t alone in feeling that way. Kevin Seeling was heading to the Gulf War in November 1990 when he asked his wife to watch his motorcycle and take it for an occasional spin. When he returned home the following year, he realized that his wife Angelle had done more than that–having installed a wheelie bar, rear slick, and air shifter while competing in bracket races. 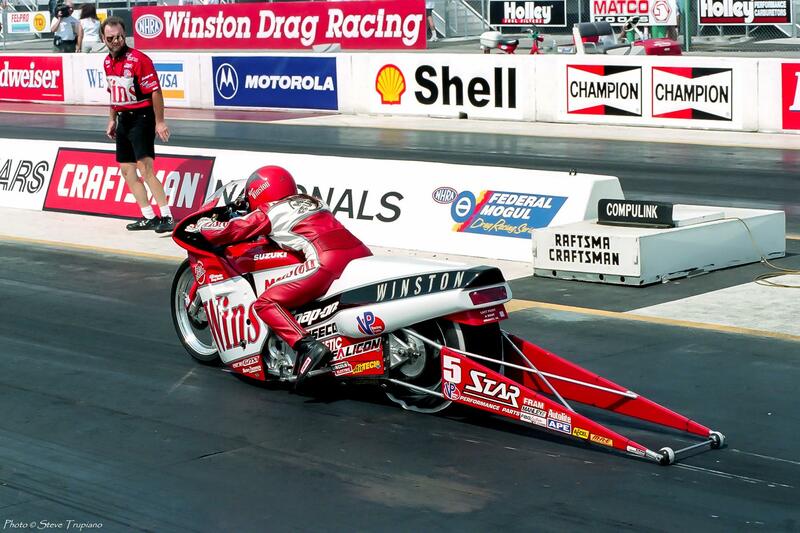 Angelle Sampey won NHRA Pro Stock Motorcycle championships in 2000, 2001 and 2002, and finished second in the standings twice. 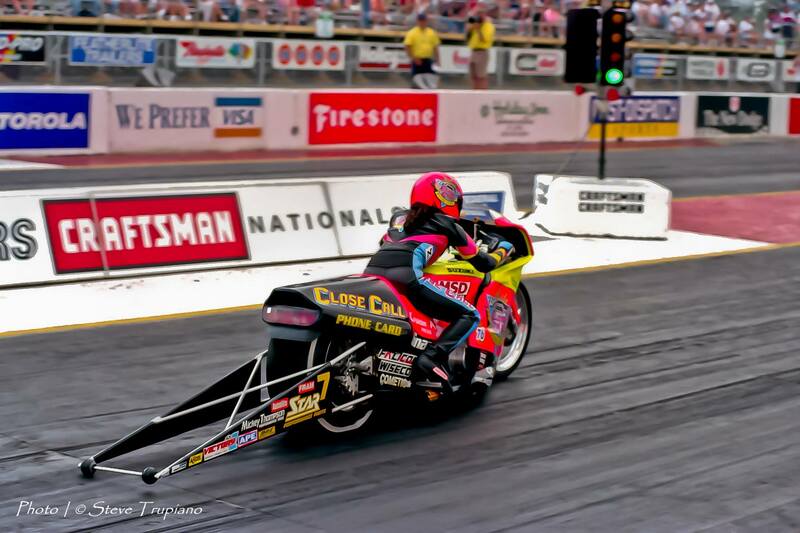 The fact that Angelle Sampey was only the second female in NHRA history to win a national championship makes her proud. The fact that she has won three titles makes her prouder. The 2016 version of the Star Racing squad. Angelle Sampey and Cory Reed will drive with George Bryce, Jackie Bryce, Ken Johnson and Jerry Cooper focused on tuning and management. The determination was clearly there; it would be up to Star Racing’s George Bryce to determine if the talent was as well. Bryce was also an instructor at Frank Hawley’s racing school and Sampey wanted to be a student. After meeting, Bryce told her that she “had natural ability and she could do it if she really wanted it and worked at it”. He also suggested that she take the class again. She ended up taking it five times and setting the elapsed time record for the school. As was quickly apparent, the track was where she belonged. 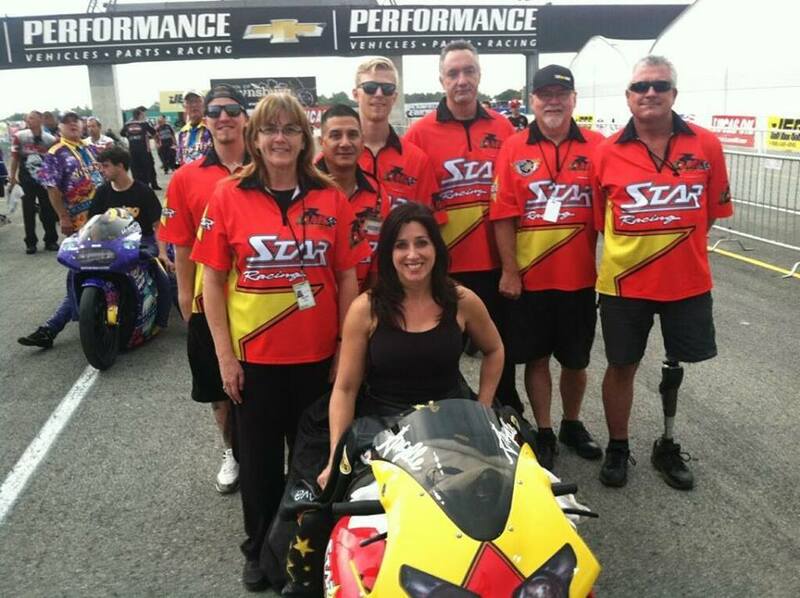 During the course of her career, Star Racing sponsored-Angelle Sampey has won three NHRA Pro Stock Bike championships, forty-one national events and recorded wins 72 percent of the time. She isn’t someone you want in the other lane. 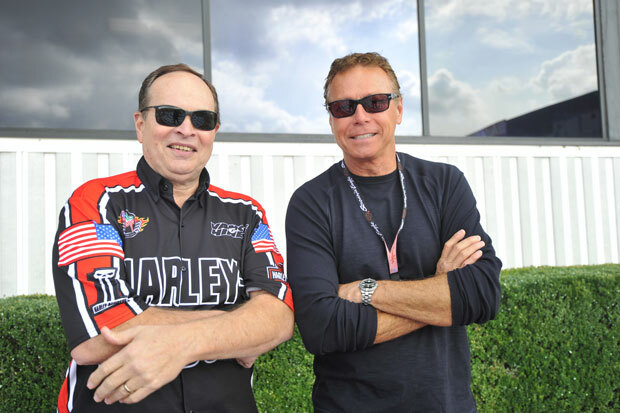 When Pro Stock Bike was beginning its incredible growth in the mid-Seventies, Terry Vance and Byron Hines decided to be part of it. Although the larger displacement Kawasaki Z-1 was the choice for many, Vance and Hines chose to race a Honda 750 instead. In 1976, they entered–and won–their first AMDRA race by defeating Kawasaki-mounted Mike Bruso. The following year, Suzuki approached Vance about racing its new GS750. “They really wanted to get something going, Vance recalls. So did he and Byron. The Suzuki offer was accepted and the team’s success began. The pair also appeared in much of the company’s advertising–helping them gain market share and the sport gain an important audience. 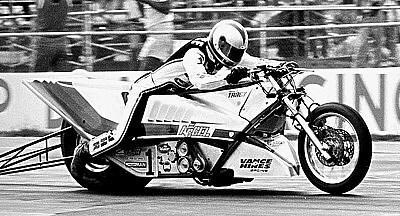 Terry Vance on the Vance and Hines Top Fuel Motorcycle. The bike would later be purchased by Larry “Spiderman” McBride. 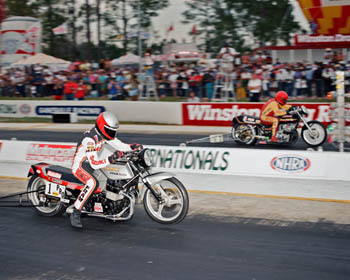 In March of 1987, the pair competed at Gainesville–the first NHRA race at which motorcycles were a professional category. Vance won the event with an 8.092 second pass at 165.04 mph. While Byron Hines-tuned machines have earned scores of victories, he has also won as a rider. 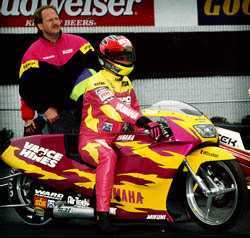 In 1992, Hines won an NHRA Pro Stock Bike race at Topeka on a Yamaha. Terry Vance wasn’t the only one on the team doing the riding. So for a while, was Byron Hines. After serving in Vietnam, Hines moved to Southern California—“Mecca” at the time for motorcycle drag racing. He had the good fortune to know what he wanted to do, and the equally good fortune to find an ideal place in which to do it. Hines was the first employee of Russ Collins’ R. C. Engineering, the place to go for performance work on four-cylinder engines. As with virtually all performance-oriented businesses, George and Jackie Bryce believed that the best way to promote theirs was through racing. 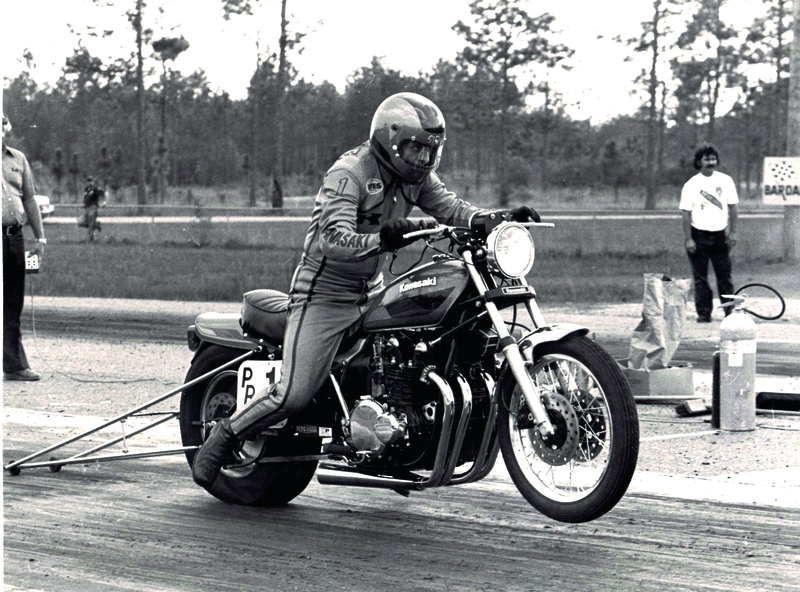 Having won IDBA and NMRA championships on a Kawasaki Turbo Funny Bike, George decided to focus on the NHRA Pro Stock Bike class–and he would do it with John Myers riding. George Bryce and Jackie Bryce have been together since 1973. Earlier, Bryce had worked on Myers’ bike at the same time that he (Bryce) was having trouble riding his own. “John said he would ride it for me to help me work it out,” he recalls. “He went down the track and I said to myself ‘I like the way that looks’. I immediately thought I could be more successful if I could focus on tuning the bike and have someone with the talent of John Myers riding for me.” The decision was obviously a good one as Myers ended the 1989 season–the first together–second in points. Even with a second place finish, money would become an issue as it so often does. At the U.S. Nationals that year, Bryce had to borrow money from his wife’s parents to be able to race. The team had recently completed a Suzuki GSX-R on which Myers set a track record in qualifying. Afterwards, they were offered far more money for the machine than it was worth, leaving Bryce with “a lot of thinking to do”. Wisely, Bryce decided to keep the bike. 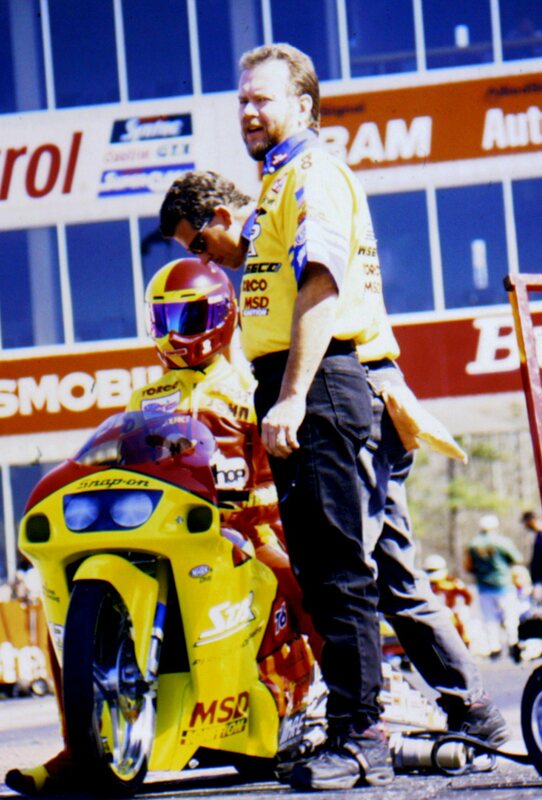 The team qualified first at the next 17 events and Myers would go on to win three NHRA Pro Stock Bike championships. 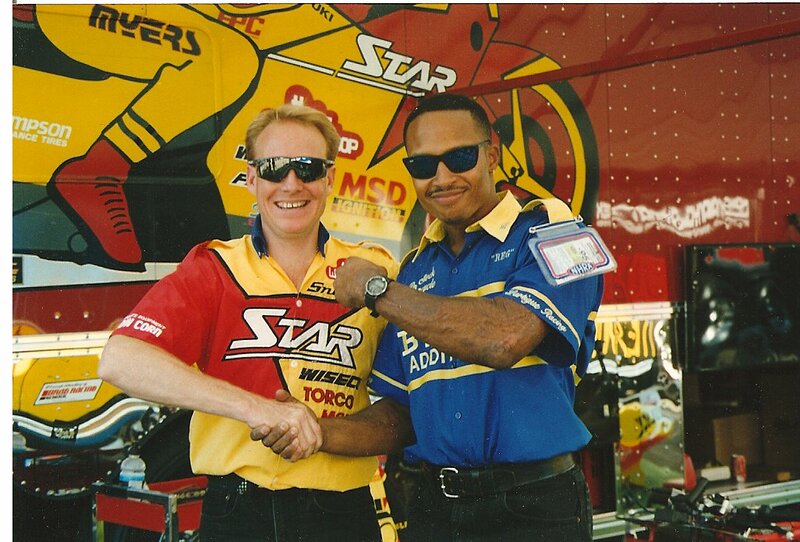 Star Racing was—and still is–one of the premier Pro Stock Motorcycle teams, having won 6 NHRA championships (1990, 1992, 1995, 2000, 2001, and 2002). 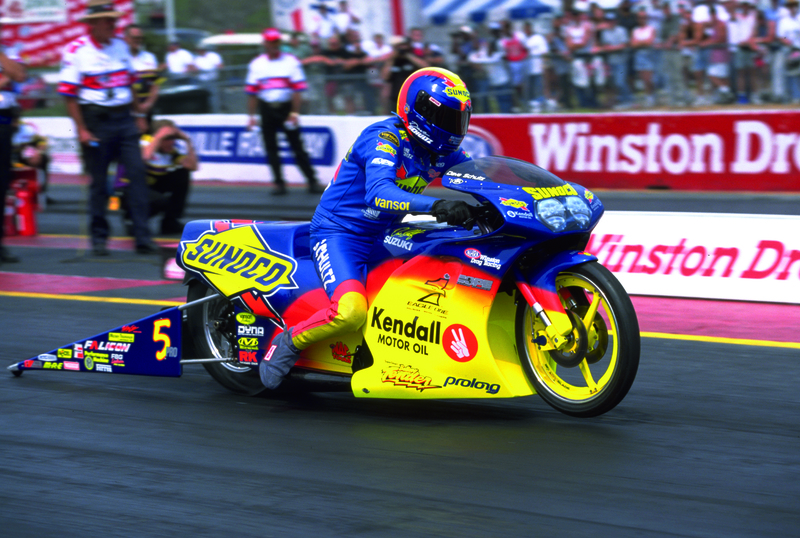 For 13 consecutive seasons–from 1990 to 2002–team riders won the Number 1 or Number 2 plates in NHRA championship point standings. George Bryce still gets excited to win. After 2000, the Pro Stock Bike class would change fairly dramatically–and in the next installment, you’ll find out how. Very good article but , no mention of the first woman of Pro Stock Bike Vikki Farr ! Watched her dominate any and everything she raced ! She was and is awesome ! This comes from a car guy ! Chip Solley….ask any of the men you laud in your book and they’ll remember him. The late John Myers was his protege. In the first ever NMRA 1979 Inaugural Event In Gainesville he beat Terry Vance in first round eliminations, “Superbike” Mike in the second round and Bob Carpenter in the final. 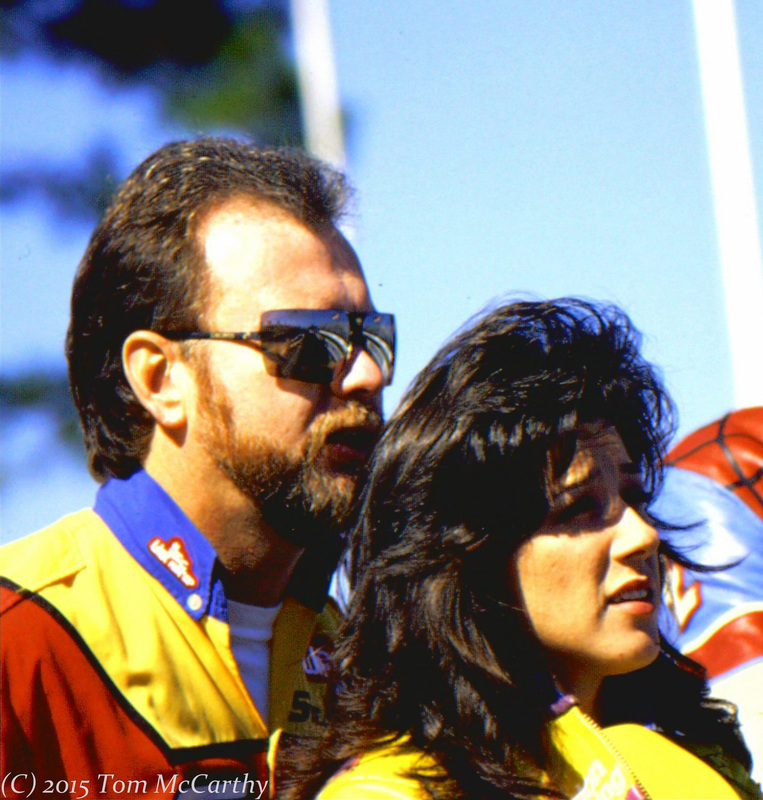 In 1982 he won the IDBA ProStock Championship. Chip was the first to run an airshifter. And just when he found a sponsor and was ready to sign a million dollar deal, he got hit by a motorcycle at a 100 mph. He was in the hospital for 9 months. “Pizza” John Mafero made a special trip to visit him in the hospital. Chip was a natural born genius with bikes. He could make one run on a bike and know just what to tweak & modify to make it better. 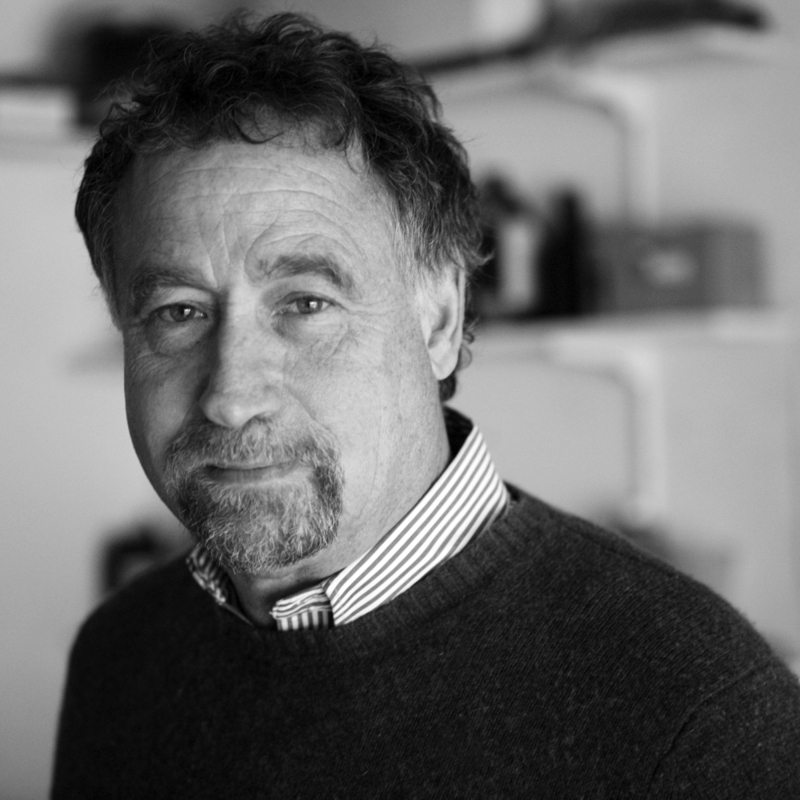 He still loves the sport and is still a genius…he’d love to be a consultant. He’s so good, he can troubleshoot a problem just by listening. What a thrill it would give him for one of the “old guys” to call him. Shawn, I had the pleasure of racing with your Dad, Lance was a real gentleman and your Mom was a wonderful person too. I remember in 1991 when I broke all my spare motors your Dad lent me one of his bullets to stay in the race. Lance was a great competitor and as I recalled road and tuned his own bike, very well I may add. “Nitro Fuel bikes were mostly high gear because of the limits of the available gearboxes. In 1971 I had an idea to build a 2 speed using a Borg Warner overdrive planetary gear set applied by a foot lever activated automatic transmission band for full throttle no clutch shifts. The available automatic transmission gear sets were too big and heavy. During the winter John designed and built a new Double Norton HogSlayer for the 1972 season. At first the high gear bike was still faster because of traction problems. We worked with Sandy Kosman to build the first motorcycle hub for the16” Cragar Monocoque car wheel. Our sponsor M&H supplied a modified 600/16-car slick. The combination of slider clutch, 2 speed & 6”tire proved almost unbeatable. After we won the 1972 NHRA World Finals everyone wanted a 2 speed. We couldn’t build them fast enough. Sonny Routt and Joe Smith got automotive transmission builder Lenco to make a motorcycle transmission before we could get into production.” I think you should contact Gregory for an interview. Just a short note to say Thank you for all the hard work you have put in here assembling all the data on MC drag racing history. It is a Huge Task but you are doing a great job.